Robert's inspiring paintings are therapeutic images which soothe and renew the spirit. His motifs reflect the enjoyment of living in places characteristic of America at its best. Robert travels widely to paint and lecture, and his work is available in oils, pastels, serigraphs, prints and posters. 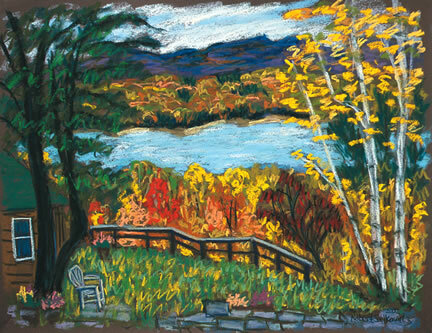 Robert paints the American landscape from Maine to Florida; New York to California. He has homes and studios near Woodstock, NY and the Gulf of St. Lawrence, Cape Breton Island, Nova Scotia. He remains active in the Arts in Healthcare movement. His work can be seen at Spirit o' the Sea Gallery, Cap Le Moine, Nova Scotia, Lyghtesome Gallery, Antigonish, Nova Scotia.